Tim Storrier limited edition fine art archival pigment ink print titled The histrionic Wayfarer, STAY VERY ALERT POST MODERNISTS ‘HAVE BEEN SIGHTED’ not suitable for children, edition size is 70 only, Sheet size 61x100cm, Image size is 47x94cm, Waffarer is hand signed titled and numberd by Tim Storrier. 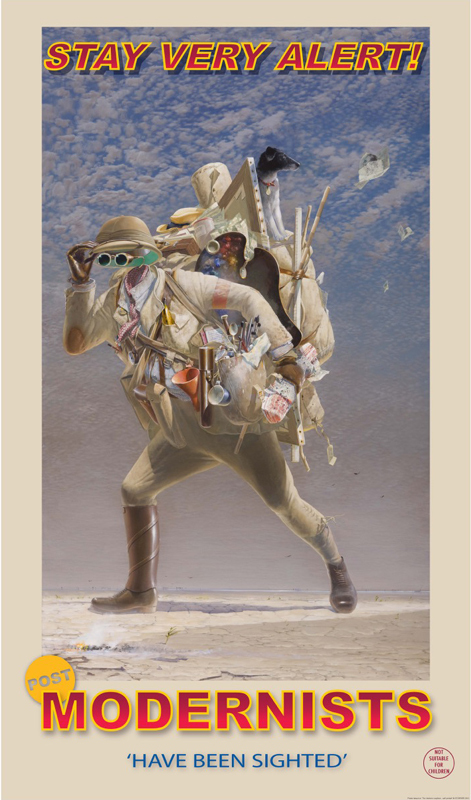 Tim Storrier was represented in last year’s Archibald Prize with another self-portrait without a face. Entitled Moon boy (self-portrait as a young man), the figure was represented by a suit of empty clothes hanging as if on a scarecrow in a barren landscape.